Slice is an online database of medical images that allows you to upload your medical images and keep track of them, collaborative annotation and sharing of resources for students to refer to at a later time. It is part of the BEST Network (The Biomedical Education Skills and Training Network), a not-for profit digitally-powered community of biomedical Schools developing and sharing next-generation courseware and education technology. For more information, please follow this link: BEST Network. You can join the Slice network HERE for free. A number of video tutorials can be found on YouTube. Please click HERE to go directly to the Best Network channel. An example of how Slice can be used to create in-class practical activities. 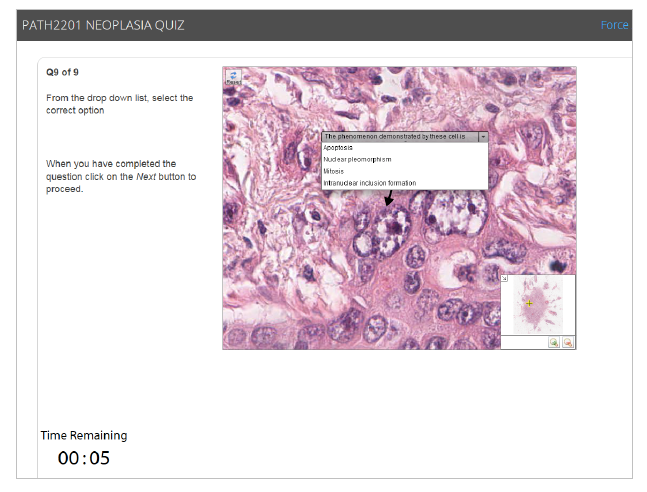 Slice is used for the creation of practical exercises and quizzes that are used in the teaching of histopathology in the Medicine and Medical Sciences Programs. The collaborative annotation tool has been created to facilitate real time interaction with digital slides amongst students, and between students and teachers. This tool also allows students to retain a record of their work, which can be accessed via a URL, rather than creating a WORD document. Using images from SLICE, together with the menu of possibilities for lesson creation offered through the Smart Sparrow platform, quizzes can be designed either as stand alone assessment tools, or as interactive activities that provide real time feedback. There are many capabilities on the SLICE platform that can be exploited, however, its primary drawback is that its use is not intuitive. However, with some initial guidance, it opens up many possibilities for learning. Further development of the SLICE capability? If elements of an audience response system could be incorporated into the facility, this would take the tool to another level of interactivity. The 2015 Learning and Teaching poster for this exemplar can be found here: Enabling Online, Real-Time Classroom Interactions with Digital Images to Support Student Learning. The PowerPoint slides for the presentation given by Stephanie Dowdell at the 2015 Medicine Learning and Teaching forum can be found here: Collaborative Annotation. A description of all the activities that were ran by Nalini Pather using Slice can be found HERE.